England forwards David Wilson and George Kruis have been cleared of respective charges of making contact with the eyes or eye area, and biting. 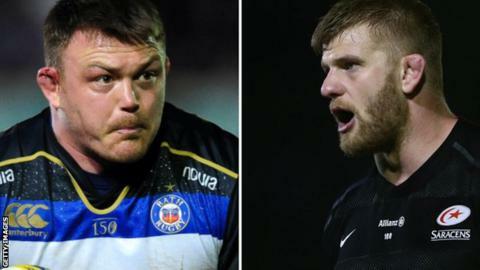 Bath prop Wilson, 30, and Saracens lock Kruis, 26, were cited after an incident involving the pair in the second half of Friday's Premiership match. A long-term ban could have ruled both out of the summer internationals. Saracens forwards coach Alex Sanderson said the citings were a result of "over-officiating". "George Kruis a biter? Really? We just couldn't believe it," Sanderson told BBC Radio 5 live before the outcome of the disciplinary hearing was known. "He's not got a nasty bone in his body, so that kind of accusation was pretty shocking. I was surprised about the citing allegations. I thought they were a bit unnecessary. No-one saw the need for them post-game." Both players were in England's 2015 World Cup squad, although only Kruis featured in this year's Six Nations, with Wilson is yet to feature under new head coach Eddie Jones. England's summer starts against Wales at Twickenham on 29 May, before a three-match Test series with Australia in June.